No event of the 20th century produced a greater effect upon the Catholic Church than Vatican II, the 21st Ecumenical Council. To many it might seem to have been simply a meeting of important churchmen gathered to discuss church matters, but because the Catholic Church is the only church founded on this earth by God himself to guide men to salvation, the reality is that centuries from now historians will likely consider it, (as well as the message to the world delivered by the Mother of God during her personal visit at Fatima in 1917), as one of the two pivotal events of world history for the recently ended century. Vatican II opened fifty years ago on October 11, 1962. Since it ended in 1965, the council has been written of in countless books, articles, scholarly journals, magazines, and newspapers all over the world. Things said and done since the council, in the name of the council and in opposition to it, have affected the lives of everyone living since that time. 4. A “pastoral” or a “doctrinal” council? 1. The pontificate of Pius XII: triumph or the start of a crisis? 7. A secret society inside the Church? b) Father Réginald Garrigou-Lagrange: where is the new theology going? 1. The death of Pius XII: the end of an era? b) The “Estates General” of the Church? d) What does “ecumenical” council mean? 5. John XXIII and “the signs of the supernatural” in the Church. b) Bishop de Proença Sigaud: the council between revolution and counter-Revolution. 9. Cardinal Bea appears on the scene. 5. Why doesn’t Vatican II speak of hell? 14. The “black week”: but for whom? The history of the Catholic Church is at the center of universal history, on account of the primary role that the Church plays in the guidance of souls and the building up of civil society. From this perspective, the importance of the ecumenical councils in universal history is no surprise, since they are one of the highest expressions of the social life of the Church. If the Church has some relationship with the history of humanity, then an ecumenical council will have a relationship with that same history that is similar to the one that it has with the Church. Councils are called ecumenical (or general) when, under the direction of the pope or of his representatives, they gather bishops from the entire oikuménē, which means from the whole inhabited world. In the councils the voice of the pope and of the world’s bishops united with him speaks up about historic events: this solemn voice makes the history of the Church and, with it, the history of the world. In the history of the Church twenty-one councils have been held that are recognized by the Church as being ecumenical, or general. The last one was Vatican Council II, opened in Rome in Saint Peter’s Basilica by John XXIII on October 11, 1962, and concluded in the same place, after four sessions, by Paul VI on December 8, 1965. From the Council of Nicaea, which after the Council of Jerusalem was the first council written about by historians, to Vatican II, every council has been the subject of an historiographical debate. Every one of these assemblies not only made history, but then had its historians, and each of them brought to his work his own interpretive view. Unlike the preceding councils, however, Vatican II poses a new problem for historians. Councils exercise, under and with the pope, a solemn magisterium [teaching authority] in matters of faith and morals and set themselves up as supreme judges and legislators, insofar as Church law is concerned. The Second Vatican Council did not issue laws, and it did not even deliberate definitively on questions of faith and morals. The lack of dogmatic definitions inevitably started a discussion about the nature of the documents and about how to apply them in the so-called “post-conciliar period.” For this reason the problem of the relation between the council and the “post-conciliar period” is at the heart of the ongoing hermeneutical debate. The famous black-and-white photograph of the Second Vatican Council in session, taken from a high balcony at the back of Saint Peter’s Basilica, shows more than 2,000 Council Fathers standing at their places in slanted stalls that line the nave, with more than a dozen rows on either side. It resembles nothing so much as a gargantuan monastic choir—unless it puts you in mind of the British Parliament with the dimensions quadrupled. Contemporary perceptions of the Council varied widely, partly because of the extensive media coverage. Although it promulgated a dogmatic constitution on the Church, Lumen Gentium, Vatican II was not a “constitutional convention.” An ecumenical council can teach about the Church but cannot modify a divine institution, any more than a pope can invent a new doctrine or change one of the Ten Commandments. Professor de Mattei outlines the two main schools of thought in that discussion. The first and more theological approach presupposes an “uninterrupted ecclesial Tradition” and therefore expects the documents of Vatican II to be interpreted in a way consistent with authoritative Church teaching in the past. This is the “hermeneutic of continuity” emphasized by Pope Benedict XVI. A second, more historical approach advocated by Professor Giuseppe Alberigo and the “School of Bologna” maintains that the Council “was in the first place an historical ‘event’ which, as such, meant an undeniable discontinuity with the past: it raised hopes, started polemics and debates, and in the final analysis inaugurated a new era.” The “event-dimension” of the Council is Exhibit A in making the case for the elusive “spirit of Vatican II” that looks beyond the actual words of the conciliar documents to the momentum that they supposedly generated. Drawing on the work of two Catholic historians and the director of a Catholic news service, this article highlights features in the historical background to the Second Vatican Council by asking the basic questions of journalism: who, what, where, when and why. Although several were soon to become world famous, none of the 2,381 prelates in the stalls at St. Peter’s on October 11, 1962, and no combination of them, could have initiated an ecumenical council; that was the sole prerogative of the Supreme Pontiff. At that moment the bishop of Rome was the former Cardinal Angelo Giuseppe Roncalli, who when elected pope in 1958 had taken the name John XXIII. The media image of “Good Pope John,” the unpretentious, grandfatherly pontiff, had its basis in fact. Roncalli was gracious and optimistic by nature, and studiously avoided taking sides in the theological disputes that increasingly divided the Catholic Church. Yet a full portrait is more complex, as we read in Pope John and His Revolution, by the Catholic British historian E. E. Y. Hales. Roncalli did have “peasant roots”—his parents were sharecroppers—but he was also descended from the impoverished branch of a noble family. His diary shows that he had pursued sanctity since his seminary days, yet he excelled in history rather than theology. His priestly ministry was spent almost entirely in chancery, seminary, and diplomatic positions (with the exception of a few years as an army chaplain during World War I); it is ironic that the ecumenical council he convened as pope should proclaim itself to be “pastoral”. Pope John’s contribution to the writing of the Vatican II documents may have been minimal, yet his view of his own pastoral ministry and of the Church’s role in the modern world had a momentous effect during the Council and in the years that followed. The question, “What was Vatican II about?” is objectively answered by reading the titles of the documents that the Council approved. From a broader perspective, it is often noted that in some respects the Council completed the work of Vatican I, which had defined precisely the powers of the papacy but had been adjourned before it could discuss episcopal authority in the Church. Besides Modernism, de Mattei examines various 20th-century movements within the Church: biblical, philosophical, liturgical, ecumenical. He depicts a fruitful theological pluralism which in places was bursting the seams of the neo-Thomistic system that was still prevalent, especially in the Roman Curia. Through the participation of theological experts at Vatican II, the best of that scholarship contributed significantly to the conciliar documents. But the journals of several “periti”—scholarly experts—that have been published in recent years confirm that neo-Modernism was a real force and that some advisors arrived with scores to settle and strategies for refighting old battles. When the Council first met on October 13, 1962, “the day’s agenda provided that the assembly would elect its representatives (sixteen out of twenty-four) on each of the ten Commissions that were delegated to examine the schemas drawn up by the Preparatory Commission.” All Council Fathers were eligible, unless they already had been appointed to the commissions. Ballots were distributed with a separate page listing the names of those who already had expertise in certain areas because of their work on the related preparatory commissions. “The Central-European conferences were the first to play the new role assigned to them,” according to de Mattei. The bishops’ conferences of the Rhineland nations—France, Germany, and the Low Countries—had a disproportionate share of the Church’s wealth, universities, publishing houses, and news services, so it was no surprise that most of the candidates whom they proposed were elected to the Conciliar Commissions. The “European Alliance,” as it was nicknamed, then used its position of dominance to discard many of the schemas that had been drawn up by the preparatory commissions, and to start over with texts drafted by the progressive periti. These two shifts had momentous consequences during the four sessions of the Council and in the postconciliar period: (1) authority was displaced from individual bishops and Curial officials (who held authority delegated directly by the Pope) to ad hoc geographical gatherings of prelates that were usually run by a few movers and shakers, and to theologians who were simple priests; (2) the Council strangely became less “ecumenical” and more Eurocentric—an ominous trend, in hindsight. This influx of Central European and “democratic” ideas into the workings of the Roman Church was captured by Father Ralph M. Wilgten, SVD, editor of the Divine Word News Service, in the title of his classic book, The Rhine Flows into the Tiber. Political unrest interrupted Vatican I: King Victor Emmanuel of Italy captured and annexed the city of Rome, and French armies could no longer vouch for the Council Fathers’ safety. Less than 100 years later, Vatican II conducted its sessions during the Cold War, with Europe divided, the Soviet sphere of influence expanding, and an uneasy peace maintained by a policy of mutual assured destruction. Despite this intervention and others like it, when the fourth session of the Council opened, the revised schema still made no explicit reference to communism. A petition asking for a reiteration of the Church’s teaching against communism was drawn up by the International Group of Fathers, headed by Archbishop Sigaud of Diamantina, Brazil, and Archbishop Marcel Lefebvre, and signed by 450 Council Fathers. Although it was submitted in due form and in a timely fashion, a French prelate in the Curia shelved it, so that the intervention never reached the commission to which it was submitted. Some Council Fathers had warned that the Council’s silence about the errors of communism would be viewed by history as cowardice and a dereliction of duty. The progressives at the Council argued that a condemnation would jeopardize negotiations with communist governments. Was a crucial teaching moment missed? Those who wonder why the Church held its 21st ecumenical council at all might have to wait until the next life to learn the full answer. Still, the stated purposes of Vatican II should be our starting point. Professor de Mattei notes that in October 1962 the Council Fathers informally issued a “Message to the World.” In it they proclaimed: “In conducting our work, we will give major consideration to all that pertains to the dignity of man and contributes to true brotherhood among peoples.” Good Pope John was apparently persuaded that a war-torn world was finally ready to listen again to the age-old wisdom of Holy Mother Church—a truly international society—and that the institutional Church had to gear itself up for this new dialogue with contemporary man. This rapid, journalistic survey of Vatican II focused not on what it taught in its documents but rather on several important circumstances of the “event,” some of the opportunities and obstacles that helped shape the Council. As the Church observes the 50th anniversary of the beginning of the Second Vatican Council, the conciliar teachings should be understood against the contrasting background of historical facts, without being reduced to an “epiphenomenon” determined by those facts. Michael J. Miller writes from Glenside, Pennsylvania. He headed a team of translators who prepared the English edition of The Second Vatican Council: An Unwritten Story by Roberto de Mattei. This article originally appearred in The Catholic World Report in 2012. 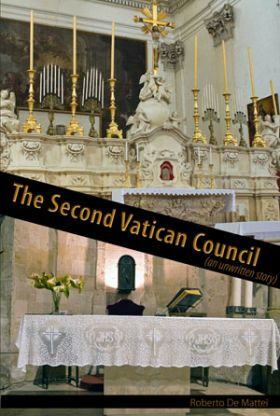 The new book by Prof. Roberto de Mattei, entitled Concilio Vaticano II. Una storia mai scritta (The Second Vatican Council: a story which has never been told. )Vatican Council II. The story which was never told), by Lindau Editions, has been published in Italy in the past few days. An vigorous debate has ensued with the participation of distinguished apologists such as Francesco Agnoli, Mario Palmaro, Alessandro Gnocchi and Corrado Gnerre on the one hand, and the progressive historian Alberto Melloni, of the so-called Bologna school, and the moderate sociologist Massimo Introvigne. on the other. Prof de Mattei has himself taken part in the debate with his article published in the newspaper “Libero” on December 12, 2010. Forty-five years have passed since the conclusion of the Second Vatican Council, the 21st such council in the history of the Church, but the problems arising from it remain alive and well. One of these problems is the relationship between the “letter” (the texts) and the “spirit” of the Council. These are advanced, respectively, by the two rival schools of continuity and discontinuity. The confrontation between these two schools, however, is in danger of becoming a dialogue of the deaf. The documents promulgated by Church authorities do not all have the same value, theologically speaking. If Benedict XVI expresses some opinions in an interview, as has happened in his latest book Light of the World, these should be received with great respect because they come from the Vicar of Christ. But regarding authoritative teaching, there is a difference between an interview and the definition of a dogma, since the former does not compel the assent of the faithful. The same can be said of a Council like Vatican II, which, as a solemn gathering of bishops united with the Pope, proposed authentic teachings that certainly do not lack authority. But only someone who ignores theology could attribute a level of “infallibility” to these teachings. Not all Catholics know that Papal infallibility applies only to rare, solemn pronouncements on matters of faith and morals, and many more non-Catholics do not understand this either. A Council has the authority that the Pope who convokes and leads it would like to attribute to it. All the pronouncements of Popes John XXIII and Paul VI before, during and after Vatican II emphasise its non-dogmatic and pastoral dimension. Benedict XVI attributes to it the same pastoral and non-definitive intent and yet the “hermeneutic of continuity” he advocates is completely misunderstood by many Catholics, progressives and conservatives alike. The affirmation that Vatican II is in continuity with the Church’s Magisterium obviously presupposes the existence of some doubts and ambiguities in Council documents which therefore require some interpretation. For Benedict XVI, the criterion of interpreting such passages cannot be other than the Church’s Tradition, as he himself has repeated many times. If one agrees, on the other hand, with those such as the followers of the website “Viva il Concilio” (“Long Live the Council”) that Vatican II created a hermeneutical criterion for re-interpreting tradition, this would be paradoxically to attribute interpretative force to something that needs to be interpreted. To interpret tradition in the light of Vatican II, instead of the other way around, would be possible only if the position of Alberigo (the author of a very substantial 5 volume History of Vatican II) is accepted, which gives interpretative value not to the “letter” or the texts, but to the “spirit” of the Council. This is not, however, Benedict XVI’s position, which is critical of the hermeneutic of discontinuity precisely because it attributes primacy to the spirit , not the texts. Msgr. Gherardini, professor emeritus of Ecclesiology at the Lateran University, in his volume Concilio Vaticano II. Un discorso da fare (2009) has developed well the correct criterion of theological hermeneutics. Either one claims, as Gherardini does, that the Council’s doctrines are not compatible with previous definitions, and that they are neither infallible nor unchangeable and therefore not binding, or one assigns to the Council an authority that obscures the previous twenty councils of the Church, abrogating or replacing all of them. On this last point there does not seem to be a difference between the historians of the Bologna school, as Professor. Alberto Melloni, and sociologists such as Massimo Introvigne who seem to attribute infallibility to Vatican II. There is also a second problem that goes beyond the question of the continuity or discontinuity of the Council texts, and it is not so much about theology as about history. It is the theme I wanted to tackle in my recent book Il Concilio Vaticano II. Una storia mai scritta (Editore Lindau). I have not attempted to undertake a theological reading of the Council documents, in the sense of wanting to assess whether they are in conformity or not with the Church’s Tradition, but I have tried instead to give a historical account of all that happened in Rome between October 11, 1962 and December 8, 1965. It is a work that complements theological studies and should not cause anyone to worry. It is impossible to understand the alarmist reactions of those who fear this history will be grist to the mill of the hermeneutic of discontinuity. Would this be a good reason for not writing the history of Vatican II? Should its history be left entirely in the hands of the Bologna school, which has made scientifically valuable but ideologically tendentious contributions? If elements of discontinuity were to emerge at the historical level, why should we fear bringing them to light? How can one deny a discontinuity, if not in the content then at least in the new language of Vatican II? A language which consists not only of words but also of silences, gestures and omissions can reveal the deeper currents of an event even more than the content of a speech. The history of the unexplainable silence about Communism on the part of a Council that should have been concerned with the facts of the world cannot, for example, be ignored. The historian who has this task cannot isolate the texts of Vatican II from the historical context in which they were produced, because it is precisely the context, and not the texts, with which the historian is concerned. In the same way, the Second Vatican Council cannot be presented as an event that was born and died in the space of three years without considering the deep roots, and the equally deep consequences, that are also found in the Church and in society.